This is what you might call a classic survival memoir. It is about how easily individuals can fall through the gaps and lose themselves, but most of all it is about how people survive against the odds—in this instance, with the sustaining power of poetry and perhaps ultimately, love. ‘Sectioned’ is an understated memoir leavened with wry humour. It documents a lost world of 1980’s squats, homelessness, hostels, half way houses, prison—interrupted by four stints in the type of vast old asylums that no longer exist. For me, it recalled Samuel Beckett’s novel ‘Murphy’, a story of life adrift in the 1950’s. Three decades later, life on the margins is a similarly desultory trawl. I must admit a vested interest here. My mother spent a number of years in psychiatric institutions but wouldn’t speak about it. The glimpses offered here are mostly benign, though the prospect of the long-term wards hover as a threat. Like any other society, there are moments of humour and companionship as well as the darker aspects. There is a sense in these old institutions with their sprawling grounds that they did offer some respite. People break down when their sense of identity is not longer sustainable. It is no accident that there are higher incidences of mental illness among minority communities. My mother was part of the same wave of Irish immigration as John’s parents. For both, the wider support structures had already been ruptured. When John’s father dies, the family falls apart. My mother knew that with two small children she would never go ‘home.’ Identity is fragile. Who are we? What shall we be? In John’s case, the death of his father comes at that most fragile of times, adolescence. It is not really a surprise that the centre cannot hold. Unlike my mother, he is able to voice his experience. For a previous generation, the subject was taboo. 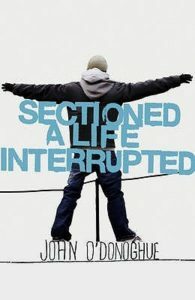 ‘Sectioned’ is also a London-Irish story, with a fondness for the city and intimate knowledge of its hidden, intimate places – shot through with trips to Ireland, to a life that could never be. It’s a story about rupture and healing, most of all it is about the triumph of the human spirit. It would be easy to see a young man like John on the street and dismiss him as a loser, a hopeless case, yet he is now a university lecturer. He has validation now, yet he was always a poet. How easily we allow people to fall by the wayside, to disappear. The endless trawl becomes a search for a way of being. This is a story about holding on and letting go, of finding a way to make sense of the past, of the transforming power of creativity.